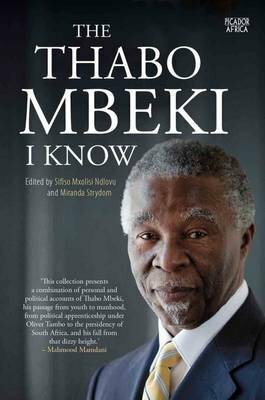 The Thabo Mbeki I Know is a collection that celebrates one of South Africa’s most exceptional thought leaders. The contributors include those who first got to know Thabo Mbeki as a young man, in South Africa and in exile, and those who encountered him as a statesman and worked alongside him as an African leader. In The Thabo Mbeki I Know, these friends, comrades, statesmen, politicians and business associates provide insights that challenge the prevailing academic narrative and present fresh perspectives on the former president’s time in office and on his legacy – a vital undertaking as we approach a decade since an embattled Thabo Mbeki left office. Edited by Miranda Strydom and Sifiso Mxolisi Ndlovu, The Thabo Mbeki I Know provides readers with an opportunity to reassess Thabo Mbeki’s contribution to post-apartheid South Africa – as both deputy president and president – to the African continent and diaspora – as a highly respected state leader – and to the international community as a whole.